Status: offline 13 year old male was climbing over a chain linked fence. His shirt was caught and he flipped over while his hand was stuck in the fence. He felt a pop and had immediate pain and swelling. What are the findings? Status: offline From a very amateur view there is a fracture of the ulnar styloid and dislocation or rupture of the ulnar colateral ligament. The space is obviously excessive. Status: offline Non-displaced fracture fifth metacarpal. Status: offline TFCC tear. Next step: MRI. Status: offline I'm guessing Triangular Fibrocartilagenous Cartilage Complex (TFCC) tear or triangular cartilage tear. 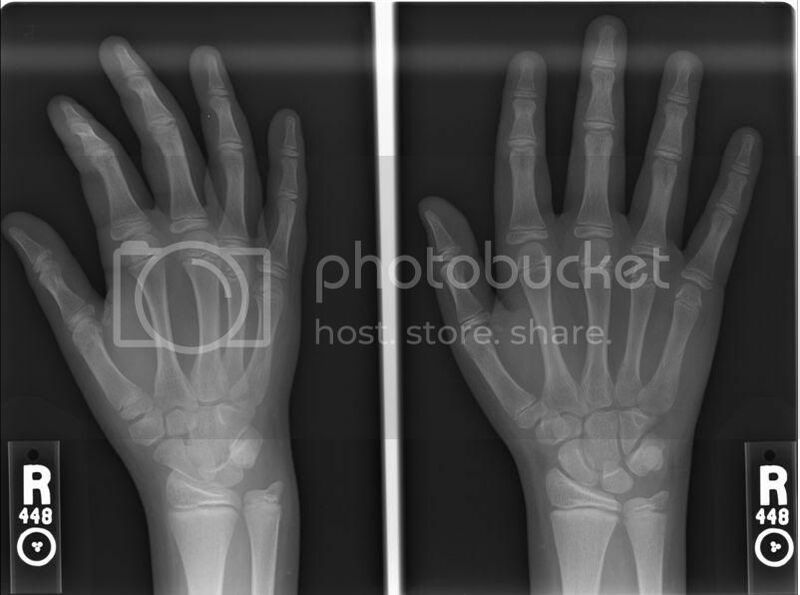 What is going on at the base of the fifth metacarpal on the first picture? Status: offline I see what you're looking at, you might be right Pablo. Usually with a MC fx you'll see displacement, but in a 13 year old it might be more of a greenstick. Status: offline Hmm, what are the findings Alex? Status: offline Once again, Pablo's on fire. Status: offline Okay. Well, if it is a midshaft fracture, and I think it is, then describe the fracture in more detail. Midshaft nondisplaced is not enough. 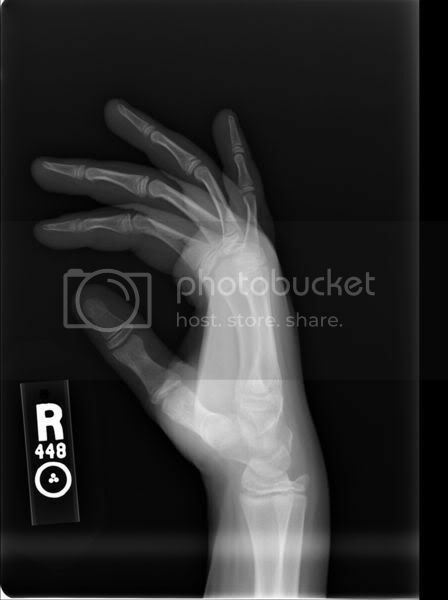 Status: offline Undisplaced spiral fracture midshaft 5th metacarpal, right hand. I think that's right. Status: offline oops. Gerry, you rock as well. Personally, I think midshaft, nondisplaced is fine. Status: offline Jeff you're right. Just gilding the lilly a little. Spiral it is. There is a non-displaced fracture of the 5th metacarpal. I'll not ever be allowed to forget it because it took several days for me to take him to the orthopedist. Whenever he gets hurt now, and I say it's nothing serious, he reminds us all how I would not take him to the doctor when his hand was broken. Sigh. Thank goodness for teenagers who keep us humble. Thanks Alex for these great case studies. They are always fun and challenging, and I really appreciate the effort you take to post them. Usually, when I check in on the board, the X-ray has been up a while and there are many responses. Just happened to check in at the opportune time this time! Oh, and Pablo definantly rocks! Status: offline Yes. 5th. Sorry about the typo. Good catch Sebastian. Thanks, but you did have it right before I did!